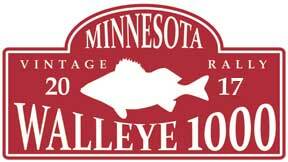 The 2017 Walleye 1000 will be held Saturday and Sunday, June 10-11, 2017. Click here to visit our Event Application page. The event is really more of a driving tour than a rally, there are no timed sections, no check points, just a good excuse to put some real miles on that old car you probably don't get to drive enough anyway, kick around some dusty rural towns and tell tall car tales among other vintage car enthusiasts. Total distance we will travel is between 500 and 600 miles. The first Walleye 1000 was 1000KM, which, by all accounts, was too much driving for two days... so, the distance has been cut, the name of the event with '1000' in it remains. The group will depart from the Greater Twin Cities area early Saturday morning and head South-East. The specific route will remain a secret until participants get their rally packs and maps during registration the morning of the event. We will spend the night in La Crosse, WI Saturday night. We will all have dinner together Saturday evening and then get a good night's rest in a nearby motel. On Sunday morning rallyists will get their cars running again for the round about return to the Twin Cities where we will have the finisher’s banquet. Prizes of questionable value and awards of questionable taste will be distributed while we all eat dinner together and recount the trials and tribulations of the recently completed journey.